"They called me a c, u, next Tuesday... To my face." Duncan (Liam James) is a 14 year old socially awkward introvert who is dragged by his mom Pam (Toni Collette) to the beach home of her new boyfriend Trent (Steve Carell) for the summer. He becomes instantly smitten with the slightly older girl next door (AnnaSophia Robb) whose mother (Allison Janney) is navigating single parenthood by drinking herself silly. Pam & Trent spend most of their time getting drunk with Kip (Rob Corddry) & Joan (Amanda Peet) and Trent seems to devote whatever time he's not drinking to belittling Duncan and making him feel inferior, when he's claiming to be doing just the opposite to Pam's face. A ray of sunshine enters Duncan's life when he has a series of strange encounters with an odd local named Owen (Sam Rockwell). Owen works at a local water park called Water Wizz, and decides to give Duncan a job. There among the misfit adults that act like children (among them Faxon, Rash & Maya Rudolph), Duncan begins to find a place where he's accepted. Things begin to go south at home, however, when Duncan discovers a nasty secret about Trent, and wrestles with whether or not to tell his mother. First things first, The Way, Way Back does not tread any new ground. These are all well-worn tropes that we've seen in countless other films, but it would be foolish to dismiss them outright. They're so commonplace because they work, but they work especially well here because the world feels very believable. One of my biggest issues with the 2009 Greg Mottola film Adventureland was that it felt like a Hollywood version of this kind of film. The Way, Way Back, on the other hand, has a verisimilitude that was not present in that film. It feels authentic in a way that many other coming of age films do not, and equal credit must be given to the film's script and it's cast. Different people are likely to connect with different aspects of this film depending upon where they are in their lives or who they were as teenagers. While I felt that the character of Duncan, at least at first, was a bit too put upon, there were little touches that I appreciated, like the way he's told by Trent that everyone must do their share to clean up around the house, and then in two separate scenes, comes home to messes left by the adults. The film also does not over-sentimentalize Duncan's plight. While it is a bit heavy handed at times, it never slips into the territory of maudlin dreck that a lesser film would have succumbed to in an instant. The handful of scenes that comprise the film's final twenty minutes are fantastically well done, and really left me with an even better overall impression of the film than I had leading up to them. I thought I knew exactly where the film was headed, and it went in another direction entirely, which I ended up liking more than what I thought was going to happen, and the final shot was a wonderful way to end the film. While Faxon & Rash's script is very good, the life that the actors bring to these characters is truly what elevates the film. I've made my love for Sam Rockwell known before, but his performance here is phenomenal. His ebullience and pure joy radiates through every scene he's in, and he handily walks away with the entire film. There are shades of mischievous characters we're all familiar with, particularly Bill Murray's character from Meatballs, but Rockwell brings an energy and a life all his own. I would love to know what was scripted and what he improvised, because it was a seamless blending of the two. The rest of the cast is also very good, the two standouts for me being Carell & Janney. Steve Carell has made a career out of playing nice guys, and his first attempt to stretch that was this year's borderline disastrous Burt Wonderstone. Here he plays a genuinely bad person and makes you believe every ounce of it. I've always known that he was a hugely talented comedic actor, but I never knew he was capable of being so convincingly awful. And Allison Janney's character also really hit home for me. I grew up around lots of women similar to her character, and she nails it with just a few key lines and scenes. While I think that The Way, Way Back is an undeniably excellent film, people will connect with it in different ways. Those of us who grew up awkward and self-conscious will relate to Duncan's plight. Those who can't seem to grow up will relate to Owen. Those who keep making the same mistakes and seem to never learn from them will relate to Pam. It's the kind of film that will hit everyone in a different way, but overall I think that it's just too good of a film for anyone to write off wholesale. More than anything else, I hope that Sam Rockwell gets major recognition for his work here. This is the kind of quintessential role for him that seems like it was written specifically for his talents, and he shows them off in spades. 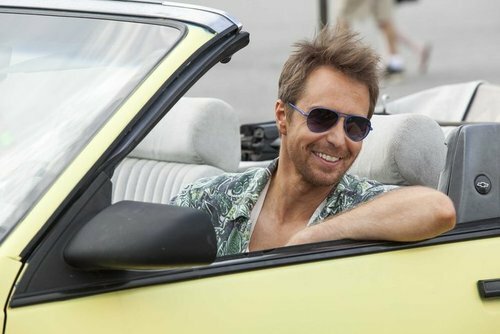 If you take nothing else away from The Way, Way Back, it's that you can't fight the feeling anymore that Sam Rockwell is one of the best actors working in film today. His joy is contagious, and I can only hope that everyone else catches it in a big way.